Features: Bus, subway and tramway museum in Chelles (Paris). Around 100 preserved vehicles. Features: Bus preservation association in Orleans. 3 preserved buses. Features: Bus preservation association in Marseille. 8 preserved buses, 3 trolleybuses and 3 tramways. Features: Bus preservation association in Marseille. 4 preserved trolleybuses, 1 bus. No activity since 2007. Features: Bus preservation association in Toulouse. 8 preserved buses. Features: trolleybus museum with circulations during fixed dates. More than 60 preserved vehicles. 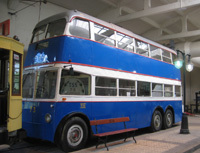 Features: Bus preservation association in Trieste (Italy). 14 buses registered. Features: Bus preservation association at Casteau (Belgique). Thirty-two preserved buses dating from the 60s and 70s period. Features: swiss trolleybus preservation association . Around 100 vehicles preserved together with its sister associations. Features: bus preservation association in Berlin. 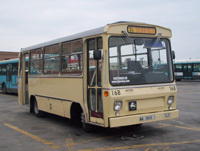 16 preserved buses and one route in regular service. Features: Bus and tramway museum in Malmköping (Sweden) 13 preserved buses. Nº of pics: 79.000 (2017) - Locations: UK, Europe. Nº of pics: 17.500 (2017) - Locations: UK, Europe. Nº of pics: 16.800 (2017) - Locations: Catalunya, España, Europe. Nº of pics: 5.500 (2017) - Locations: España, Islas Canarias. Nº of pics: 4.800 (2017) - Locations: UK, Europe. Nº of pics: 1.278 (2017) - Locations: Catalunya, España, Europe. Nº of pics: 591 (2017) - Locations: Catalunya, España, Europe.